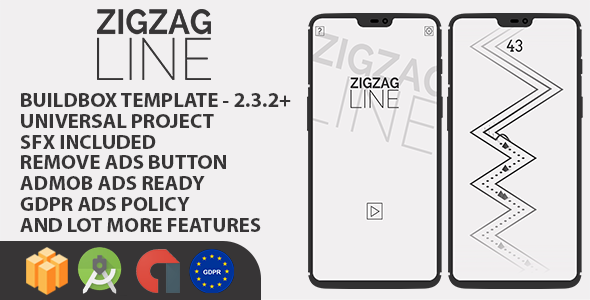 ZigZagLine is a buildbox template, simple gameplay and very easy to reskin. All the important Menu items are included such as How to play and Settings with Sound On and Off feature. There is one In App Purchase included but you can add more if you like. - PNG Images used in the game. This game is made by buildbox software, very easy to reskin and very addicting gameplay with simple graphics. This game is made from scratch from buildbox. Buildbox is a breakthrough game creation experience. Creating games is as easy as dropping images into the software, making changes to their properties and hitting play. This project will allow you to edit levels and all the graphics and also export it to platforms such as Android, iOS, Windows Desktop, Windows Desktop EXE, Windows Store, Amazon and OSX. MAKE YOUR OWN BEST GAME ON BUILDBOX. Great Opportunity to make money!